The committee that was appointed to investigate the research results published by a researcher who had previously been employed at UMB and the University of Oslo presented its report today. The two universities concluded that the consequences are not far-reaching, even though serious violations of good scientific practice have occurred. 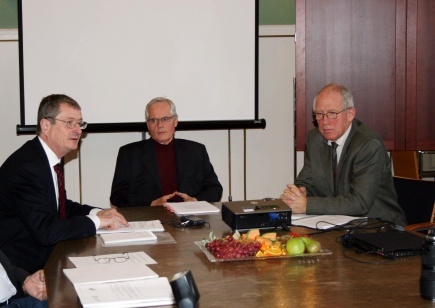 The Rector of the University of Oslo, Geir Ellingsrud (left), the committees chairman Professor Kim von Weissenberg, and the Rector of the Norwegian University of Life Sciences, Knut Hove.